Taguig court grants bail petition of Cedric Lee, Deniece Cornejo, Zimmer Raz due to lack of \"strong evidence\"
Taguig court grants bail petition of Cedric Lee, Deniece Cornejo, Zimmer Raz due to lack of "strong evidence"
Excerpt from Judge Paz Esperanza Cortes’s resolution regarding Cedric Lee, Zimmer Raz, and Deniece Cornejo’s bail petition: “This being so, although there is probable cause for the charging of the crime of serious illegal detention, the prosecution had failed to provide strong evidence that said illegal detention is actually serious or actually for the sake of kidnapping." Pansamantalang makakalaya sina Cedric Lee, Zimmer Raz, at Deniece Cornejo mula sa kasong serious illegal detention na isinampa ni Vhong Navarro laban sa kanila. Ito ay matapos magdesisyon si Judge Paz Ezperanza Cortes ng Taguig Regional Trial Court na payagang makapagpiyansa ang grupo nina Cedric at Deniece ng halagang P500,000 bawat isa. Sa resolusyon ni Judge Cortez, na may petsang September 12, na inilathala sa dzBB Twitter account, nakasaad na hindi malakas ang ebidensiyang inihain ng prosekusyon para sa kasong serious illegal detention na kinahaharap ng grupo nina Cedric at Deniece. “This being so, although there is probable cause for the charging of the crime of serious illegal detention, the prosecution had failed to provide strong evidence that said illegal detention is actually serious or actually for the sake of kidnapping. “In such a case, the Court has the duty to grant the accused bail,” saad sa bahagi ng utos ni Judge Cortes. Ang desisyong ito ng korte ay ikinatuwa ng kampo nina Cedric, Zimmer, at Deniece, na patuloy ang paggiit na hindi totoo ang paratang sa kanila ng complainant na si Vhong. Nagpadala ng opisyal na pahayag si Atty. Connie Aquino, isa sa mga legal counsel ng mga akusado, sa GMA News reporter na si Saleema Refran ngayong araw, September 15. 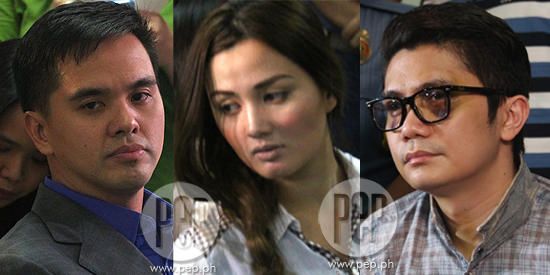 Sabi ng abugada hinggil sa pagpayag ng korte na pansamantalang makalaya sina Cedric, Zimmer, at Deniece: “We are thankful and we welcome this positive development in the case. SHOCKED BY COURT’S DECISION. Sa kabilang banda, desidido ang kampo ni Vhong na ituloy ang kaso at kuwestiyunin ang pag-grant ng bail sa mga nabanggit na akusado. "We are shocked by news that the court has granted bail. "We are just now securing a copy of the resolution. We do not know why bail was granted. "We want to know the reasons adduced by the court for this purpose. "We will question the resolution, we will pursue all the remedies that are available to rectify the situation. "A crime has been committed. "We are determined, now more than ever, to see that justice is done and that the accused are put to jail."